Yesterday was market day. How simple that sounds - in the summer there are many days in a week that are market day, so to have just one is like being on vacation. It was snowing a tiny bit when I left home, but somewhere in East Hartford I crossed a line and there began to be much more snow. By the time I got to market in Coventry, there were about 2 inches on the ground. I hate driving in snow! But I did very well, considering the hills and curves, and we arrived safely. It was a very slow market. Given the low temps and the wind chill and snow, I'd have wanted to stay home, too! Slow markets give us vendors time to visit with each other, and that's fun. I bought half a bushel of seconds apples for applesauce from Paul at !8th Century Purity Farm. I haven't made applesauce in a long time, so it was a real treat. We used to do it all the time when the girls were little. I think we put up something like 30 quarts one fall. We'd all cut up the apples and cook them, peels, cores and all, till it was nice and saucy, then put it through the Victorio strainer. They used to fight over who would get to turn the crank. The boy doesn't remember any of it and was grossed out by all the peels in the cooking pot, and the sight of the peels and cores coming out the operative end of the strainer. But the sauce is rosy and spicy, the way we love it. Edible memories. Here's my woolly entry for today. 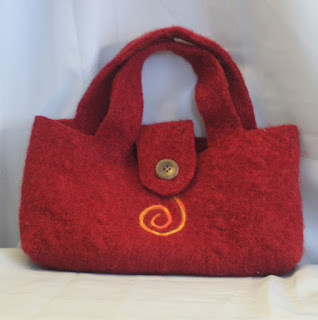 It's a bag made from a felted cable sweater. 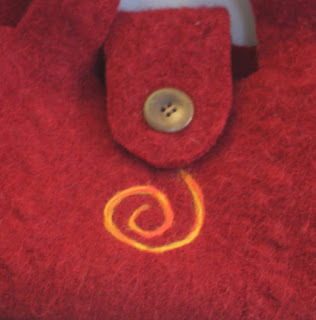 I added a needle felted spiral that reminds me of the sun. The colors are reminiscent for me of hot days of summer, and right now I'll take any heat I can get!